To customize this template after signing up, choose ‘Finance Quiz’ as example when creating a new survey. Financial decisions are a big part of life, no matter who you are or where you come from. Whether you’re just recently graduating from high school or college or just starting out in your career or independent life, the Finance Quiz is one way to help you determine how far you are on your path to financial independence. This includes understanding terms like compound interest, stocks, bonds and inflation and how they can be related. This template is a real-world example of a finance quiz which you can use as is or modify to correspond with your goals. To put things more into perspective, a global financial literacy test determined that more than two-thirds of the world’s population and only 57% of adults in the U.S. can be regarded as financially literate. Why use Survey Anyplace as a Finance Quiz Tool? Let people know what they got right and wrong immediately. With our offline functionality, quizzes can be taken online, offline, made available in any language and compatible with any device. That means higher response rates and better data. Send participants tailored feedback and reports based on their result. You decide! Add a captivating background image and experiment with all sorts of different fonts and layouts to create the perfect quiz. To use this sample Finance Quiz, sign up for Survey Anyplace , and choose ‘Finance Quiz’ as template when creating a new survey. For any type of quiz, it is a great advantage to be digital and filled out through tablet or smartphone. This allows the quiz to be shared through Email, Social Media or other online platforms. Our tool happens to do just that, with our mobile-optimized software, we are set on giving your respondents the best user experience we can. 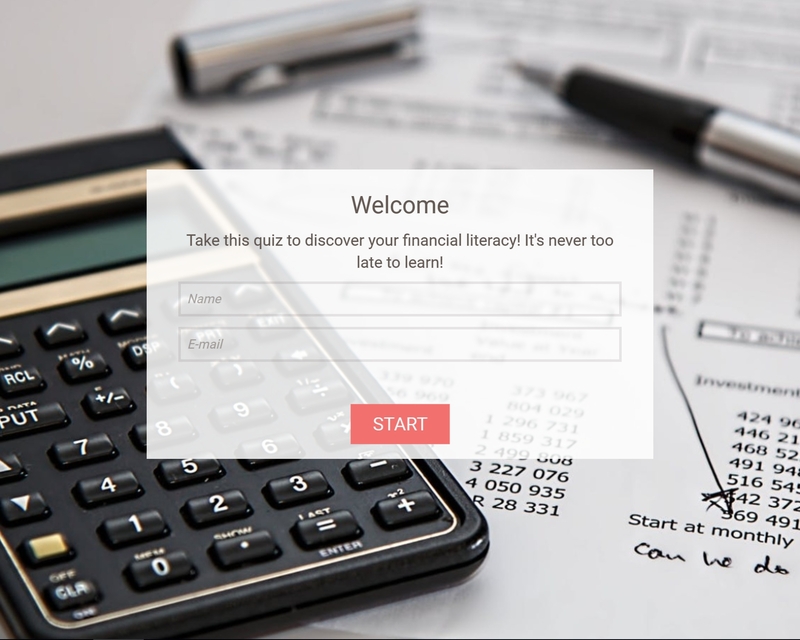 Increase workplace or classroom financial literacy with our finance quiz template!